Your humble blogger has been listening. The result is this little blog entry. Midnight at the Movies--Justin Townes Earle--Hope we get him back to the Narrows real soon. This CD is one of the best you'll hear in the country/rootsy-not-afraid-of-a-little-twang world. Unlike his daddy Steve Earle, young Justin has a more likable, accessible singing style. But like pops he knows how to create tightly written numbers that are catchy even after the first listen. Oh yeah, he does have some lyrics that reference papa: "I was a young man when, I went down the same road as my old man." Believe it or not, the old man--once a notorious druggy who ended up doing time for his ways--canned his son from his band for the youngster's less-than-healthy indulgences. A great CD, well produced with creative arrangements. In Boston-Chris Botti--This is a CD and DVD, and darn well should have won a Grammy (it got a nomination but no statuette). In case you're unfamiliar, Mr. Botti is a forty-something trumpet player who did a lot of work with Sting. Some may call him a Smooth Jazz artist (as a put-down), but he's no Kenny G baby. And this CD/DVD is entertaining with a capital E. It's a live performance at Boston's Symphony Hall with the Boston Pops and guest stars including Mr. Sting, Yo-Yo Ma, Steven Tyler (who sings "Smile Though Your Heart is Breaking" to his father in the audience), American Idol's Katherine McPhee (I don't care what you're thinking--she does a helluva job with "I Got You Under My Skin"), and others. It's a mixture of jazz, rock, classical and pop. And it works. Take a Sunday afternoon and watch the DVD. I did. Fab. The List--Rosanne Cash--The story is her dad, The Man in Black, was concerned his teenage daughter knew more about the Beatles than her backstory. So he scribbled a list of essential songs, and she tucked it away--finally getting around to recording some of 'em a few months back. "Long Black Veil," "500 Miles," and "Take These Chains from My Heart" are among the selections. Guest stars include Bruce Springsteen, but she doesn't need their help. It's a simple, unadorned recording that doesn't grab you right away--but give it a couple spins. Quality. Solid. The legendary David Grisman made his first appearance at the Narrows on Thursday, along with his "Quintet Plus." It was "Dawg Music"--kind of jazz, kind of bluegrass, kinda something else. Narrows fave Sonny Landreth, returning to our stage in April, has many fans, but one stands out particularly: Eric Clapton. "He's a giant to me," says the guitarist who was proclaimed "God" on many a highway overpass around the world. Musicologist. Historian. Researcher. Soul Man. The star of a Martin Scorsese documentary on the blues, Corey Harris, is at the Narrows tonight, and you should have no problem buying tickets at the door. This is the first time Mr. Harris is playing the Narrows, so people are still getting familiar with this celebrated performer. If you're a Taj Mahal fan, chances are you'll like this show. Last week the Narrows pushed seats aside to make way for a dance floor to handle the Buckwheat Zydeco fans. Good thing we kept it that way as Eric Lindell brought his rootsy R & B sound with more than a touch of the Big Easy with him. And the dance floor responded. Imagine what Van Morrison might sound like if he grew up on Bourbon Street. That's how Mr. Lindell sounds to your humble blogger. If you missed the show, don't miss his next visit. But get your tickets early! Abbey Road Studios, where the Beatles did a heck of a lot of recordings, is up for sale. And Sir Paul McCartney hopes it can be saved. Details here. Scroll down to the very bottom of this blog page (as the song goes "How low can you go?") and you'll see a new look for outside the Narrows. So if you get to the show early and the doors aren't open, you won't have to stand in the rain, snow, hail, dead birds or whatever falling from the sky. Thanks to our man Sam! It was electric blues with a soft, soulful touch Saturday night as Luther "Guitar Junior" Johnson and his band the Magic Rockers made their Narrows' debut. The opening, warm up numbers played by the Magic Rockers before Mr. Johnson joined them on stage could be described as "smooth blues," sort of a variation of the "smooth jazz" radio format sound. Just right for Valentine's Day Eve! Former Roomful of Blues sax guy Doug James jammed with the group in the second set, as the pace and groove deepened into the evening. Tunes included Muddy Waters' "Hoochie Coochie Man," which, of course, Mr. Johnson knew well since he served for a time as Muddy's axe man. The First Grammy Winners of the Year! Friday night, the recent winners of a Grammy for their CD "Lay Your Burden Down," Buckwheat Zydeco, brought a sold out crowd to the Narrows to prepare us for Mardi Gras! It's been too many years since we've hosted Jesse Winchester. I remember (vaguely) the first time he played the Narrows. If memory serves he just wanted some water and to be able to read quietly before the show without too many interruptions. Nice, low-key guy. Traveled alone at the time. The next visit he brought a woman, and he seemed more lively! Learn more about his upcoming visit here. Our guys The Holmes Brothers new CD "Feed My Soul" may be a few weeks away, but you can hear a couple of tracks off it right now by clicking here. The gentlemen and their soulful sounds are heading our way May 14. More details on their visit here. If you are unfamiliar with The Holmes Brothers, take a few moments to listen to their stuff linked to above. If you are into quality roots music, they are a must listen! Wild man Commander Cody (George Frayne) and his band made their Narrows' debut Friday night, with the Commander (left) banging the ivories and singing that half-crazed Western Swing thang or whatever. "Smoke, smoke, smoke that cigarette!" Talking to people who came to the show, your humble blogger noticed that a number attended because they went to incredible Commander Cody shows way back when. We think they have some new fond memories of the Commander thanks to this show! Your blogger's personal faves Professor Louie and the Crowmatix opened the night with a steaming set that won them new fans and darn well gave Commander Cody a run for his money. Blue-eyed Brit soul stirrer James Hunter is making his way to the Narrows! I've been digging him for several years now, although I thought I was one of just a handful of local fans. I'm hearing his fan-base has greatly increased in these parts. If you're a blues fan, but your wife/husband/boyfriend/girlfriend/partner doesn't share your enthusiasm, the March 22 Robert Cray show may be a great date night. Of course, your humble blogger knows, like you, Mr. Cray's big hit "Smoking Gun"--but what has he been up to lately? That's why I picked up a copy of his latest CD, "This Time," his first recording in something like 5 years. It's bluesy, it's soul--it's silky smooth, as Mr. Cray shows that his understated vocals still have the low key power to charm. And his guitar delights as well. Read a pretty interesting review here, and go to www.ncfta.org to get your tickets! 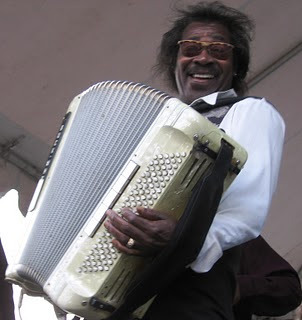 Congrats to Buckwheat Zydeco on winning a Grammy for their latest CD, "Lay Your Burden Down." You can see the group, led by Stanley "Buckwheat" Dural, Jr. (right, at the Narrows Festival in 207) at the Narrows February 12. Your humble blogger, by chance, happened to pick up a copy of "Lay Your Burden Down" just a few days back. Was I surprised! I expected to hear a lot of party music--instead there were soulful sounds that keep toes tappin' but also the brain bouncin'. There's a cover of the Bruce Springsteen tune "Back In Your Arms" that made me look up and say "hmmm, zydeco is more than dance music." If you don't particularly like to dance, don't worry--the upcoming Buckwheat Zydeco show promises to be a great sit-down-and-listen concert. On January 17, 2005, your humble blogger created this blog to chronicle the "backstage" stuff at the Narrows Center for the Arts. It just occurred to me that I've been doing this for more than 5 years now. Although I didn't add up all the entries I've written, I think there are about a thousand of 'em! Back when I started this, audiences didn't even know what the word "blog" meant. Now I'm sure some maybe many of them have blogs of their own, plus Facebook pages etc. Anyway, it's been a pleasure providing this blog to you. Thank you for your readership!